During the season of Lent, the Catholic tradition, observe the practice of not eating meat on Fridays, and often opt for fish or seafood instead. 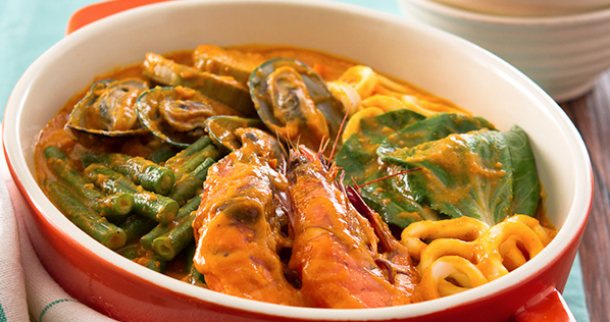 Level up your kare-kare skills with this healthier seafood version, enhanced with coconut cream. This kare-kare variant is a good source of vitamin B12, which protects you and your family from anemia. 1. Season squid with calamansi juice and ¼ teaspoon iodized fine salt. Fry until just cooked, set aside. 2. Boil tahong in 2 cups water until shells are open, remove half shell and reserve stock. 3. 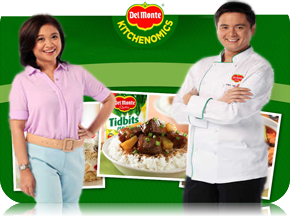 Dissolve DEL MONTE Quick 'n Easy Kare-Kare Mix in ½ cup tahong broth. Simmer for 2 minutes. Add sitaw, ginger and banana heart. Simmer for 5 minutes. 4. Add shrimps, taba ng talangka and tahong. Simmer for 5 minutes. 5. Add pechay, squid and DEL MONTE Quick 'n Easy Gata Mix. Stir and Simmer until cooked.